My unit got stuck in Demo/Simulation mode the first time I left it to charge, and this was not fixed by switching of simulation mode in the Settings. 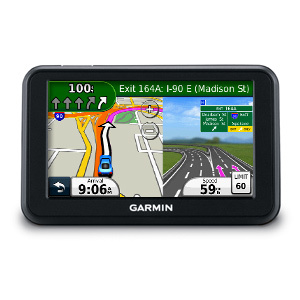 This is not cool for Garmin to let slip by, and I’m sure many users send their units back. I found a way out on the web. There is a developer page available (first map -> tap speed -> tap and hold circular speedometer), where you can disable both demo and simulation mode. The unit writes two GPX files in the GPX directory when it switches to mass storage: Current.gpx and Position.gpx. The former contains waypoints (“favorites”) and track logs, with timestamp information (vital), and the latter is just a single point for current information. You can convert these with gpsbabel, or open directly in GoogleMaps or QGis. Importing data to the unit is the one limitation. It appears from web posts and my experimentation, there is no way to upload tracks to the unit. Uploading waypoints does work fine, however, and so a track or polygon (e.g., sample plot outline) can be converted to points. Uploading is as simple as creating a GPX file (any name) and dropping it into the GPX directory of mass storage. The points will appear on the map as small black squares, and in the favorites list. Editing or deleting these waypoints requires that they first be selected from the ‘Where to? -> Favorites’ list, and then tapped on when after they appear labeled on the map. There seems to be no way to delete old tracks, other than hard resetting the unit (switch on while pressing the bottom right of the screen). Battery life is poor, but this is to be expected for a device designed to be in a vehicle. Signal reception seems pretty good: reads satellites through the roof of the Arboretum Weld Hill building! All in all, a great little, cheap GPS.